Has anybody done New Zealand far South to most Northern land's end? Planning that for March 2015. 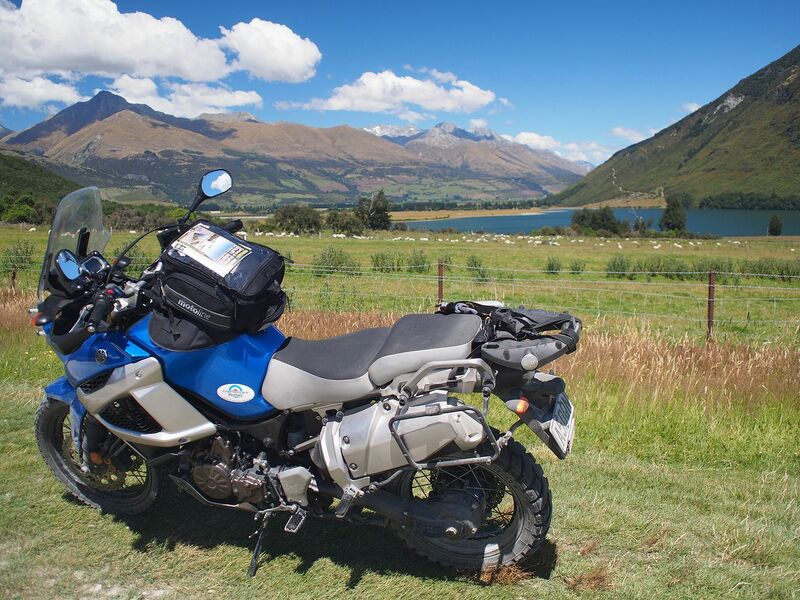 I rode New Zealand, mostly the south island, in 2008. This is a land made for motorcycles, it was two days before I found a chunk of straight road over a quarter mile long. North island has most of the people but if you are limited in time put most of it in the south. No one spot pops out as the best they were all amazing. Jahan, this is God's own country when it comes to biking. Agree, you should have the South Island on your bucket list but there is plenty to see in the north too. If you want help just ask. kiwis are generally very friendly and you will not need much support. There are some remote spots in the South Island where you might only see one car in a day. Do some planning for weather and fuel stops. When I am at home I will give you the name of a book of the 50 best bike rides in NZ. Can't remember it right now. Taking a tent sounds like the thing to do. Which coast is better to start with? South Eastern or South Western. We have three weeks of between 300 and 400km per day, depending on the road. The target is to do about 60km/h ave per day, starting at around 6:00 in the morning. Those averages worked for me on the Thailand trip last month, but I dont know if that can be done based on Camino Cerdo's post. South Western is prettier than South Eastern but has more rain. It depends what you want as an experience. South western is remote, wild and astoundingly beautiful and very like Norway. South Eastern is like Scotland in a way. Combine Scottish countryside with Karoo personalities and friendliness. Both have their attributes. The name of the book is Twisting Throttle New Zealand by Mike Hyde. I'm sure Amazon or Kalahari will supply. Do some reading and plan from there. You are not giving yourself much time, so one island will have to do. Remember that the speed limit here is 100 but you can never average that so work on about 70 kays per hour. It takes much longer to cover distance than it does in SA and around every corner there is another astonishing vista so travel is going to be slow. There are camp-sites everywhere and some farmers will allow you to camp on their land. Kiwi camping etiquette is all important as they strive to sell the clean image of NZ. Security is not a problem. Christchurch has a strong biking community and you will be able to rent an XT or similar bike. Nothing bigger is needed. Enjoy! Some really good advice from people in the know. The book mentioned by IRISH is on order. At this stage the motorcycle that is earmarked is the Suzuki V-Strom 650, but anything in the 650 range should do. It is good to hear that campsites are common and therefore attention to self-sufficiency will be needed. What is the maximum distance that one might have to cover between fuel stops on the South Island? I recently spent 4 months in NZ, on the South Island riding around on a KLR. If you want info PM me and I can put you in touch with my Boet in Christchurch and a very good friend in Queenstown. The south is prettier that the north and also much quieter. It has some awesome roads and passes......Mackenzie's and Dansys are a must...these are gravel. The Hakataramea road is brilliant. The KLR is still in my possession and is fully licensed and was serviced before I left. It sees minimal work. If you need a bike we can talk. I believe Irish is on the North Island and can probably give you more info there. Yes I am 80 kays north of Auckland on the North Island in a semi-rural area called North Rodney. The book you have ordered will give you the fuel situation for each of the rides you take on. Mike Hyde has broken the book up into basically day rides covering 50 of NZ's best. If you need any help just shout. That KLR of GT's is the way to go. Johan, regarding your question of distance between fuel stops, no need to worry. Every little hamlet village or town has fuel. And if you do run short an smiling Kiwi will sort you out. No worries mate! My ride report from the South Island earlier this year is in the 'Foreign Rides' section somewhere. Don't forget to add a bungee jump to the list, a must do in NZ where it all started. When I was there we only had a little over two weeks, averaged m/l 300 k a day. Be sure to go all the way to Invencargil (sic) The "worlds fastest Indian" was in Burt Munro's sons hardware store there most of the time, (I missed it as it was out at a show). Burt was obsessed with making his 1920 Indian Scout go faster and faster, to the point where he set records a the Bonneville salt flats. Check out the NZ stories and pictures at UltimateJourney.com a few years out of date but they did a great job of writing it up with great pictures.